Party time! Get your costume on. Make sure you buy some snacks. Get some fruit punch ready too. Oh, and don’t forget to select a costume. You’re going to want to win that costume contest at work this year. Shoot, were you going to get some decorations? After all, you want your home to look extra spooky this year. And carving pumpkins! You’re going to need to make time for that. You’re going to have to find that carving kit that’s stored away somewhere with the other holiday stuff, and… whew! All this thinking about the to-do list for Halloween is making us tired! How about you? Well, there’s no better way to head to dreamland than with a sleep mask. It seems kind of silly, but they really do work! They help block out light, so you can catch a quick catnap to help you feel refreshed for the rest of the day. This particular one has bright blue, purple, and white colors that recreate the look of a galaxy on the front! It fits with a simple elastic band for a comfy, yet snug fit. The holiday might be getting a little hectic, so be sure to get your rest! 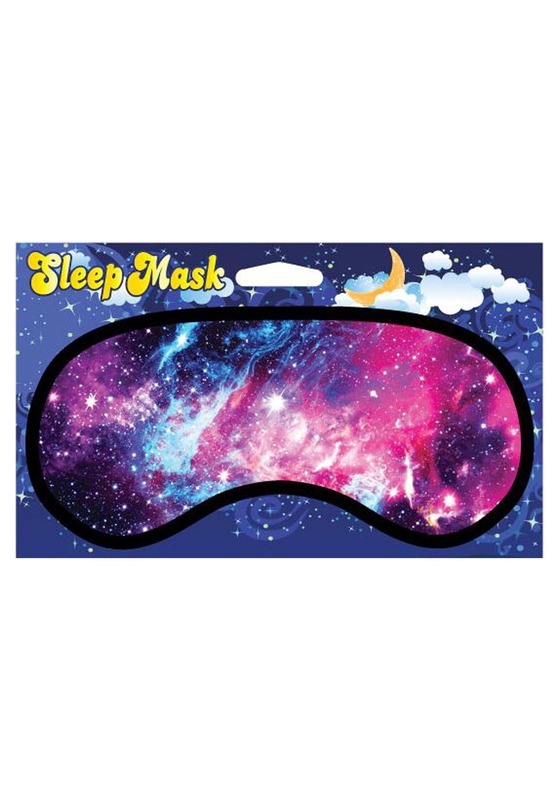 This galaxy sleep mask should help you do that in fabulous style.